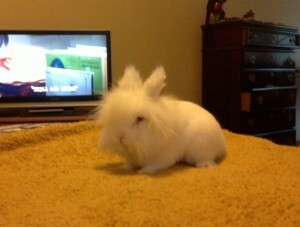 So, on with the countdown:::4 days until season 10:::Here is a pic of Mr. Bun. He is the real life bunny I used to model Jensen's stuffed rabbit in the Innocents 'verse. One of the sweetest rabbits ever, he loves to get on my shoulder and cuddle. Yay for free replacement, and hallelujah for cloud!!! Such an adorable little cutie! Thanks, he is a sweatheart and my favorite of our rabbits, which is funny because he is the rabbit we got for free when we purchased two others. The breeder had too many white rabbits and so she just gave him to us.